A one-stop website for all ur thirst of Technology and Geeks. 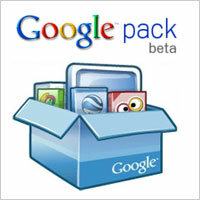 Google Pack is a software package that allows users to discover, install, and maintain a number of application programs. It was announced at the 2006 Consumer Electronics Show, on January 6. Google Pack is currently only available for Windows XP, Windows Vista, and Windows 7. All the software in the Google Pack is free no trial or spyware. Some programs may offer paid versions that provide additional features or ongoing updates, but you’ll never have to install the paid versions, and your free version will continue to work as long as you have it installed. Google also include updater, that can be used for : Monitor the status of your installation, Run software that’s been installed and Uninstall software. You can choose software applications which you want to install. If the application is already installed, Google Updater checks to see if the user has the latest version and upgrades it, if necessary. The software applications available vary based on which language and locale is selected, and operating system. The U.S. Windows XP version of Google Pack offers all of the current applications listed below. Google Toolbar for Internet Explorer - It autofills the forms on webpage and block Popups. Spyware Doctor Starter Edition - Detect and remove spyware, adware, trojans and keyloggers. Picasa - Share and edit photos. Google Photos Screensaver- Display photos from your PC and photo sharing sites. Google Talk - Chat with friends via IM. RealPlayer - Play popular media formats, organize music and videos. Google Earth - Find maps, driving directions, hotels, restaurants, and more. Norton Security Scan - Protect from viruses. Mozilla Firefox with Google Toolbar - Web browser. Adobe Reader - View, print, and search PDF files via a redesigned interface. Skype - Make free voice and video calls to anyone else on Skypee. StarOffice - Word processing, spreadsheet, presentation, and more. Click here to get Google Pack!! Firefox plugin for Ultrasurf :Anonymous web surfing. Did Google Just Buy Groupon for $2.5 Billion? Viewsonic joins the tablet bandwagon!!! MSI rolls out GTX460 HAWK!! HD6870 and GTX470 VFM war!! The Best Windows Vista Tweaks! MSI Intros GT663 Laptop GTX460 1.5GB! Dell to roll Streak in India! Make Use of Mobile Number Portability From Jan.
Google to build fiber Networks in stanford! Zroner OCes DDR3 RAM to more than 3Ghz!! !